11 Royal Exchange Place, Glasgow. G1. 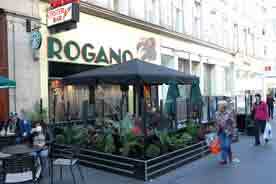 Rogano is one of my favourite places in the city of Glasgow. 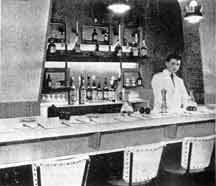 When I walk through the main doors of the restaurant I feel as if I have just stepped back in time and get a shiver, the hairs on the back of my neck even stand up. To read the full history of this wonderful establishment click here. 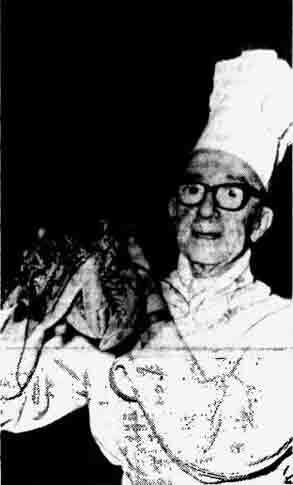 Directors of Rogano Ltd, 1961, at the annual staff dance, held at the Central Hotel. Left to right Mr. M R Thierrin; Mrs. John C Grant; Mr. D G C Grant, chairman and managing director; Mrs. V Grant; Mr. John C Grant; Miss V Grant and Mr. H R Murning, general manager. Mrs. and Mr. J C Grant, Miss Valerie Grant, Mr. D G C Grant and Mrs. V Grant. 1960. 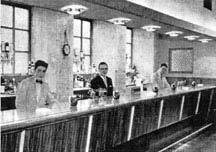 Interior of Rogano 1956. 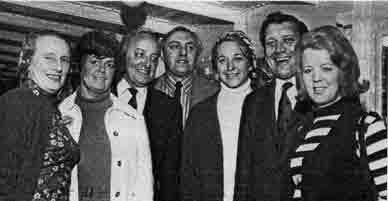 Left to right Mr. M R Thierrin, Miss Valerie Grant, Mr. Robins Millar, Mrs. Grant and Don C Grant. A view of Rogano 1930s. 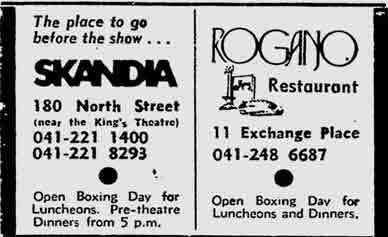 Note the off sales on the left. Interior views of Rogano, Kent Road. Another view of the Kent Road premises. More coming soon. If you wish to read more and see more pictures then contact us and we will respond quickly. Chef James Murchie, herbs make so much difference to the flavour. 1970. 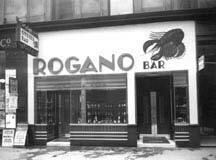 Rogano with seating outside. 2008. 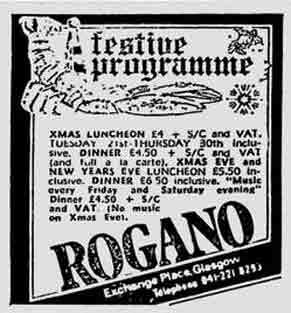 Rogano was part of a chain of pubs and restaurants owned by Alloa Breweries which included Sloans, Argyll Arcade, Victoria & Albert, Buchanan Street, The Brasserie, West Regent Street. From left: Mrs. MacFarlane (Rogano Ltd); Mrs. and Mr. I. Ingram (Samuel Dow); Mr. G Fleming (Friarshill Hotel, Paisley); Miss Valerie Grant (Rogano Ltd); Mr. Ian Kennedy (Peter Dawson); Miss Jean Orr (Skandia, Glasgow.) 1972. 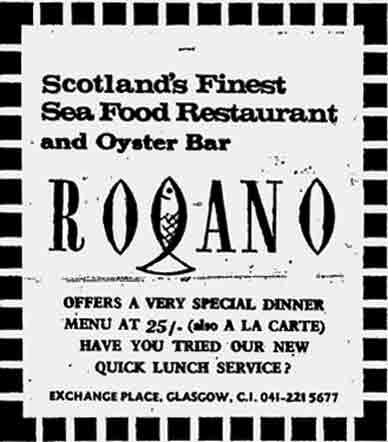 Rogano and Skandia advert 1975. 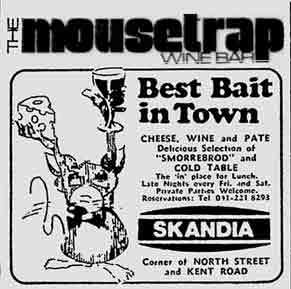 The Mousetrap wine bar advert 1976. 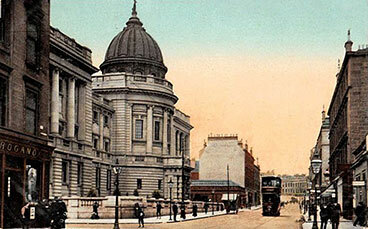 Rogano on the left with Mitchell Library North Street. 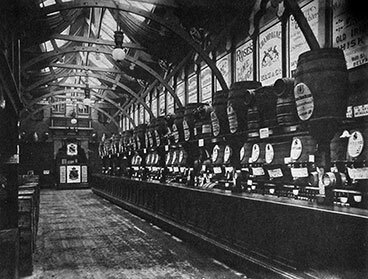 The Bodega, Glasgow Exhibition 1888. James Henry Roger. The Meal was offered at a tariff of 10 shillings and 6 pence.